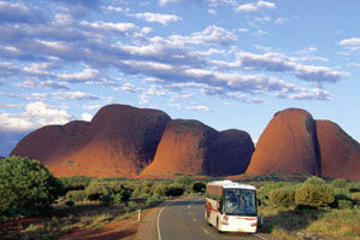 Kombinera två av Central Australiens huvudhandlingar på denna minnesvärda 2-dagars turné, inklusive övernattning och transport från Ayers Rock till Alice Springs. Lär dig om den andliga och geologiska betydelsen av den ikoniska Uluru (Ayers Rock) och förundra sig över sina förändrade nyanser vid solnedgång och soluppgång. Det är inte allt: vandra genom Walpa Gorge för att se den slående Kata Tjuta (Olgas), gå till Mutitjulu vattenhål och lära av sin betydelse för lokalbefolkningen och besöka kulturcentret Uluru-Kata Tjuta. Very disappointing and USD1500 was a total rip off. The tour was nothing near 2 days as purchashed, unless this title was due to an overnite stay. We had a pick up at 3PM and got droped of 8PM the first day. Next morning pick up 4:30AM and dropped of at 9:30AM and the picked ud again at noon for the drive back to Alice Springs. A total of 15 hours, where 10 of these were in a buss. No time for walk around the Uluru or The Olgas. Very disappointing! The price is a clear picture of the lack of competition in the Uluru-industry and WAY TO overpriced. Everything was very well organized, and the guide was very kind and friendly. Not to mention that the nature was stunning. Fantastic, spoiled only by the usual tour operator's mistaken belief that we want every second of the trip crammed with information or entertainment. We actually need a bit of down time, especially on the way back, to think about all the things we've learned and experienced. Less is more! Very good trip and tour guide are very nice and helpful. It is suitable for you if you have got only two days. This company provides good service.